We’d love your help. Let us know what’s wrong with this preview of Running Is My Therapy by Scott Douglas. There’s no other book like this. Longtime running writer Scott Douglas marshals expert advice (especially his own, cultivated from more than 110,000 miles of personal experience), and a growing body of scientific research to show how running can make us happier. How? Everyone knows that running builds stronger muscles and a healthier heart; science now shows it also helps develop a healthier brain. For those struggling with depression and anxiety, a consistent running routine can enhance the mental-health benefits of talk therapy, antidepressants, and cognitive behavioral therapy. The key to running’s therapeutic power lies in its lasting physiological effects, inducing changes in brain structure and chemistry that other forms of exercise don’t—including the best mood boost in all of sports, thanks to the body’s release of natural pain-relievers. To ask other readers questions about Running Is My Therapy, please sign up. Nothing earth-shattering here, but overall an earnest, thoughtful reflection on what running can and cannot do to improve one’s mental health. At times I felt like the author’s case studies were too limited to his friends, but I liked his voice and the way he blended memoir with self-help research. I check out and skim a lot of running books that I never review here because I don't finish them. I expected that to be the case with this one, too, but I was so pleasantly surprised by this book that I not only kept it one day beyond the library due-date (horrors!) in order to finish it, I also plan to buy it, which is unusual for me even with the running books I do finish. Depression is a fact in my family. I now believe I've suffered from it on and off, the worst instances being as a teen befo I check out and skim a lot of running books that I never review here because I don't finish them. I expected that to be the case with this one, too, but I was so pleasantly surprised by this book that I not only kept it one day beyond the library due-date (horrors!) in order to finish it, I also plan to buy it, which is unusual for me even with the running books I do finish. Depression is a fact in my family. I now believe I've suffered from it on and off, the worst instances being as a teen before I discovered running, as a college student when my parents got divorced (the one time I did a course of talk therapy), and at two times in my adult life when exercise was difficult (the first when I was in Far East Russia for Peace Corps after my now-husband left following a two-month visit, and the second during the first four months post-partum with baby twins). I've never been diagnosed with it, and others in my family have had it worse. I don't believe I've ever had it as markedly as Douglas has--he describes his condition as dysthymia, a chronic state of low-grade depression--but as I read this book, I was struck over and over by the similarities between not only his condition and how I've sometimes felt (especially when I wasn't running, or couldn't) but also his general relationship with running and mine. If I don't have diagnosable depression at the moment, I'm now thoroughly convinced it's because I run. Sentence after sentence in this book, I found, could have been describing me. The author is a realist: running doesn't solve everything, he states upfront in the introduction: "I'm never going to be a skipping-down-the-street kind of guy..." I, likewise, will never be an evangelical gusher about my running or, except maybe when I write about books I like, anything else, even things I truly believe in like my religion and my wonderful family. Douglas admits he often just doesn't like to work and that the mundanity of daily life and the certainty that annoyances will happen (the dishwasher will stop working, the dog will need to go to the vet etc.) can really bring him down--sentiments I, too, have to fight off. But, as for the author, for me running helps me "more often be my best--interested in rather than dismissive of others, engaged in rather than beaten down by work, hopeful rather than fearful toward the future. The time I spend running is powerful medicine not just while I'm running but most of the rest of the day, too." He then goes on to talk more explicitly about the science behind how running can help people with depression and anxiety, both from a neurological brain-centered perspective and from a more qualitative point of view focused on social interaction, goal-setting and as a supplement to traditional therapy and medications. He discusses not only his own experiences as a person with dysthymia and as a recovering alcoholic but interviews a wide spectrum of other runners with depression and/or anxiety, from professionals on down into the ranks of recreational types like me. His writing is clear and characterized by a self-deprecating dry humor that made his thesis even more appealing. Full disclosure: I'm thanked in the Acknowledgements, so I'm certainly biased. But I wanted to be involved with this project from the moment I heard about it because the topic is near and dear to my heart, and Douglas' final product does not disappoint. With a fine melding of scientific data and personal anecdote, he offers the reader a rare glimpse into both mental illness and the often-overlooked ways we attempt to self-medicate through exercise, namely running. From chemical neurotransmitters Full disclosure: I'm thanked in the Acknowledgements, so I'm certainly biased. But I wanted to be involved with this project from the moment I heard about it because the topic is near and dear to my heart, and Douglas' final product does not disappoint. A book focused on, as the author succintly puts it, "integration of body and mind via running in managing depression and anxiety". The first part of the book shares the author's personal experiences with their professional writing career, and how running has helped them with anxiety. It also delves into the mental health benefits of running (a minimum of twice a week is suggested), along with ample evidence and scientific data backing up their claims. The second part of the book, and the meat of A book focused on, as the author succintly puts it, "integration of body and mind via running in managing depression and anxiety". The second part of the book, and the meat of the reading, focuses on the "intersection of running and several forms of therapy". Each chapter clearly delineates what it covers: Running and Antidepressants, How Running Affects Your Mood, Running and Behavioral Therapy, and so forth. This review sounds and probably feels a bit clinical - and it is. Why? I feel it matches the tone of the book - odd, considering the author shares much of their personal (and sometimes painful) experiences, in a friendly and engaging manner. Yet you can't take the journalist out of the book, and so, I found this book to read more like a highly researched magazine article. Very informative, chock full of scientific journal summaries and experts in both running and mental health. And yet... it's missing something for me. Perhaps it's that I'm not technically a runner. The author states early on, "to be a runner, you just have to run". WIth that criteria, I am a runner. Have I struggled with depression in the past? You betcha. Do I now? No. So this may be where it falls flat for me. It's clinical, it's informative, and it's well-written. I, however, want a bit more color and 'oomph' in my books. I believe there are certain behaviors and coping mechanisms that, when one suffers from mental health issues, one is innately drawn to. Obviously, there are people who self-medicate with drugs and alcohol. On the other (nerdier) end of the spectrum, I’ve noticed a definite correlation between mental illness and comics creators, whether that be anxiety or depression or whatnot. There’s something therapeutic in the process of sitting alone, drawing, working through mental anguish and then releasin I believe there are certain behaviors and coping mechanisms that, when one suffers from mental health issues, one is innately drawn to. Obviously, there are people who self-medicate with drugs and alcohol. On the other (nerdier) end of the spectrum, I’ve noticed a definite correlation between mental illness and comics creators, whether that be anxiety or depression or whatnot. There’s something therapeutic in the process of sitting alone, drawing, working through mental anguish and then releasing it to the public; a cursory survey of the independent comics scene backs this up in a big way. I’ve also long believed that running - not just exercise but running specifically - attracts its fair share of mental heath sufferers. 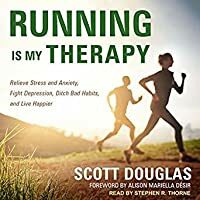 Lo and behold, along comes “Running Is My Therapy: Relieve Stress And Anxiety, Fight Depression, Ditch Bad Habits, And Live Happier” by “Runner’s World” editor, Scott Douglas, to confirm my suspicions. As a resurgent runner and someone who lives with mental illness, this book was music to my ears and also provided me with some relevant tips, techniques, and inspirations. Scott Douglas has dysthymia, a kind of pervasive low-grade depression. I have cyclothymia, a mild form of bi-polar disorder; basically, like Douglas, I have a similar low-level depression but it alternates with extremely subdued manic periods (what most people would deem “normal”). Though I do take antidepressants, it’s not trite to admit that running IS, in fact, my therapy. There are few things more refreshing and reinvigorating than the exhausted glow I get following a particularly long run or a hard workout. “Running Is My Therapy” explains why: the way running alters brain chemistry and structure, how it reinforces cognitive and creative processes, the ways it encourages restorative behaviors, etc. Douglas supports these revelations with fascinating (and sometimes slightly dry) scientific evidence of how the simple act of putting one foot in front of the other at an aerobic pace can unlock benefits that equal - and sometimes rival - therapy, medication, and other more accepted forms of self-care. The book also provides some guidance on how to best harness these benefits, including how to recognize if you’re relying too much on running to manage your mental health (as someone who admittedly has an obsessive personality, I found this section to be very useful). “Running Is My Therapy” is a stark reminder that, in the United States, we rely too much on pharmaceuticals and expensive treatments when a perfectly adequate treatment is a single step away. Running is My Therapy confirmed everything I suspected about running and it's effect on depression, anxiety, stress management and general mood. Scott Douglas includes his personal experiences with depression and running as well as accounts from other runners (friends and strangers) who have used running to manage their depression or anxiety. The book also includes research results and suggestions from these results for the amount and duration of running needed to aid treatment of depression and Running is My Therapy confirmed everything I suspected about running and it's effect on depression, anxiety, stress management and general mood. Scott Douglas includes his personal experiences with depression and running as well as accounts from other runners (friends and strangers) who have used running to manage their depression or anxiety. The book also includes research results and suggestions from these results for the amount and duration of running needed to aid treatment of depression and anxiety. Douglas also covers other forms of treatment and how they might best be integrated with running (mindfulness training, medication, therapy). He recognizes that these mental challenges exist on a spectrum...some will be able to manage their situations with running alone, others will need medication or therapy in addition to running. I thoroughly enjoyed this. Some of the points felt repetitive after a while, but I personally find reading different people's accounts of how running has helped improve their mental health and overall quality of life really fascinating. Least of all because I connect pretty hard with that sentiment - as it's mirrored my own experience with running. If you often find yourself spending not insignificant amounts of time reading up articles on Runner's World, eclectic health facts, and running memoir I thoroughly enjoyed this. Some of the points felt repetitive after a while, but I personally find reading different people's accounts of how running has helped improve their mental health and overall quality of life really fascinating. Least of all because I connect pretty hard with that sentiment - as it's mirrored my own experience with running. -Researchers at the University of Arizona have shown increased levels of Endocannabinoids (the proposed runner's high) in the brain in humans following a run. Endocannabinoids are substances that bind to the same receptors in the brain as THC, the substance responsible for the marijuana high. - Researchers propose that a feedback loop that occurs with the tapping of the runners foot against the ground shows increased activity as seen on the MRI in the brain that does not occur with cycling or sw -Researchers at the University of Arizona have shown increased levels of Endocannabinoids (the proposed runner's high) in the brain in humans following a run. Endocannabinoids are substances that bind to the same receptors in the brain as THC, the substance responsible for the marijuana high. - Researchers propose that a feedback loop that occurs with the tapping of the runners foot against the ground shows increased activity as seen on the MRI in the brain that does not occur with cycling or swimming. - The most effective location for improving mood while running, is not surprising to be trails/parks/green spaces where man made structures are not around. - A unique study was completed in Germany with 11 ultra-runners to see if they could keep their hand in a bucket of ice water for 3 minutes. All eleven (although rating it 6/10 of pain) passed. A control group of non-runners had only 3 complete the challenge. It raises the chicken or the egg question-- are runners genetically have greater pain tolerance, or does running allow one to develop better pain tolerance. - The first step out the door is the most important..then typically after 20 minutes the benefits of running on mood are achieved. 4 stars. Of course there are types of mental disorders that can not be cured with running, but this book makes a good case for the ability of a jog in nature being an outstanding therapy (often better than talk therapy) for treating depression. I think a lot of what is in this book is great information, but it is very dry and boring. I also felt a lot was dragged out to make the chapters and book longer, which wasn't needed. A lot of the information is kinda like, "duh, I knew that" especially if you are a running already. This is more in reference to the social aspect and benefits of running. I did learn a lot of good information about how anxiety and depression can be helped with running. "Running Is My Therapy" feels like a long Runner's World article. It's very informative and the author shares some anecdotes from personal experience with depression and anecdotes from other runners. I wish the book delve more into the author's battle with depression and running. I picked this book up from the library, hoping it might interest my high school cross country running son. He wasn't interested at this time, but I chose to read it and enjoyed it quite a lot. I liked Scott Douglas' writing style (in my experience/opinion, journalists-do-not-always-authors-make, and I feel Douglas is an exception), and I also enjoyed reading both the research and the anecdotes. While I've never been any type of distance runner (though I've jogged a handful of 10Ks), Douglas insi I picked this book up from the library, hoping it might interest my high school cross country running son. He wasn't interested at this time, but I chose to read it and enjoyed it quite a lot. I liked Scott Douglas' writing style (in my experience/opinion, journalists-do-not-always-authors-make, and I feel Douglas is an exception), and I also enjoyed reading both the research and the anecdotes. While I've never been any type of distance runner (though I've jogged a handful of 10Ks), Douglas insists that if you run any distance at any speed with any sort of regularity, then you're a runner. I recommend it to readers who are interested in running and feel they might gain any sort of insight by reading the connections he makes between running and mental health. I would say 3 1/2 stars too. Yes running is good for you and can help a lot. Some good notions, habits and ideas. Interesting discussion on the effects of anti-depressants on runners. A similar look at consumption of alcohol for runners. Good general ideas about mixing up running. Sometimes solo, sometimes with groups. Different distances different settings especially natural settings are better for your mind. "Experience and a growing body of research show that regular physical exercise is just as beneficial for your brain as it is for your heart, muscles, bones, and every other part of your body." As a runner myself, I want to understand not only how running helps my body, but also my mental health. I have noticed personally that when I don't run for a long time, my mood is all over the place, I feel very meh, I don't want to do anything, I just want to lay and read, but whe Pretty good book overall. As a runner myself, I want to understand not only how running helps my body, but also my mental health. I have noticed personally that when I don't run for a long time, my mood is all over the place, I feel very meh, I don't want to do anything, I just want to lay and read, but when I run consistently I feel like I can take over the world, I can even be an engineer (i really can't, but I want to think that way!). "When my aura of sourness became too overwhelming, she’d say, “Why don’t you go for a run?”. My mom really thinks that running at this point will help me with ANYTHING, because she has seen me countless times after my run and how it affects my whole mood, how excited I get, there wasn't any time that I'd come from a run and still felt moody, sad, depressed, anxious. So from my experience I can even say that running really does wonders. Personally, at this point I don't even run for physical aspects, I do it for my brain, it feels like you take your brain and blow the dust from it. Physical benefits are countless though. "The name of the running shoe brand Asics is an acronym for the Latin phrase anima sana in corpore sano. The literal translation is “a healthy soul in a healthy body.” Interesting fact I found out through this book. "Amid all this self-loathing, though, a bright spot emerged. A friend had signed up for a marathon, and I’d been watching his journey unfold on Facebook, and what struck me was that he was not your “typical runner” (he was black and not stick thin). Yet that wasn’t stopping him, and his training seemed to be transforming his life. Because he was so unlike what I felt a marathon runner looked like and much closer to a “mortal” like me (at the time, I couldn’t run a mile without stopping), I began to think that maybe I could (and should) run a marathon, too. I had nothing to lose, so I signed up and, in exchange for fundraising for The Leukemia and Lymphoma Society, received my first training plan." This paragraph just proves that you need to talk about the things that make you happy, because you never know who is watching or listening to you. This is one long review, I liked the book, there were parts that I wasn't personally interested, like antidepressants, but maybe for someone out there it will be interesting. P.S. The author never claims that running is going to cure everything and anything. In 2003, my 42 year old cousin passed away from cancer. He was an avid runner, and each year took part in Atlanta's Peachtree Road Race. I decided to take up running after he passed so that I could keep running the race in his honor and memory. That decision led to an almost decade long love affair with running. Well, sometimes love, sometimes pure avarice, but I kept running. Through rain, winter weather, in Nikes, Vibrams, huaraches, and even bare feet. Then, somewhere around 2013 or so, I sto In 2003, my 42 year old cousin passed away from cancer. He was an avid runner, and each year took part in Atlanta's Peachtree Road Race. I decided to take up running after he passed so that I could keep running the race in his honor and memory. That decision led to an almost decade long love affair with running. Well, sometimes love, sometimes pure avarice, but I kept running. Through rain, winter weather, in Nikes, Vibrams, huaraches, and even bare feet. Then, somewhere around 2013 or so, I stopped. I lost my mojo. This book has me eager to run again, though for different reasons. Now I'm 52. I deal with anxiety, and on some days, a partly cloudy mood that feels like minor depression takes hold. I don't want to take meds and I want to steer the mental ship back on course. I want to live a life that holistically mitigates the symptoms and causes of anxiety and minor depression. And so, while I used to run as a form of fitness, as exercise, as a way to honor a lost loved one and to 'find myself', I am now contemplating running to - for lack of a better term - save my life. To keep the wolves at bay, to find a sense of hunger and ambition again, to shake off the listlessness and malaise. This book was a great tool in inspiring that. In concise, digestible chapters, Douglas addresses how running helps with anxiety, mood, and depression. He speaks to how running creates a structure for the brain, goals that are attainable and easy to build upon, even if you are only running short distances at a glacial pace (which is my current M.O.). He addresses how antidepressants affect running (a chapter I merely skimmed, as that's not a road I wish to go down, but it was helpful to see the science of it), and how such tools as mindfulness align with running. Some of the information here is common sense and some of it was newly enlightening because he shares some data/science I wasn't aware of that contextualizes the claims. Mostly, I used this book as leverage to inspire me to run not because I need to lose 15 lbs or to prove I've still "got it", but because now it's a health issue, on a physical, mental, emotional, and spiritual level. I need to move to stave off some monsters before they grow too big, before they get more nimble and learn to outrun me. Before their whispered chants of "you can't, you won't" grow to drown out the still audible hum of my better angels. The title caught my eye, as I immediately felt that I “got” the concept. I hesitated to start it and questioned whether I could get much value or satisfaction from reading a book on a topic that I had already bought into and am already benefitting from. I am very glad that I read it. What the author did was bring context and sound explanations to many of the good feelings and benefits that come through running. He goes into how the brain changes over time, the chemical reactions that occur during The title caught my eye, as I immediately felt that I “got” the concept. I hesitated to start it and questioned whether I could get much value or satisfaction from reading a book on a topic that I had already bought into and am already benefitting from. I am very glad that I read it. What the author did was bring context and sound explanations to many of the good feelings and benefits that come through running. He goes into how the brain changes over time, the chemical reactions that occur during different types of runs, and other lessons that he has learned through his research and his years of running. He combines his views with many thoughts and insights from other runners and colleagues with similar backgrounds which kept each chapter flowing easily. I am fortunate in that I have not personally suffered from depression or anxiety to a degree that has caused me to seek prescriptions or brought me to a level of mood disorders that he addresses. However, the information on various drugs and their effects in relation to or even in combination with running was interesting. If a person is experiencing this or has used medication for these conditions then the information is definitely very valuable. He also incorporates some material on topics such as mindfulness and meditation that I do have more familiarity with, which I found very helpful and well presented. I’ve used the phrase/hashtag “running is my therapy” without ever knowing it was a book and a phrase that carried people just like me through the challenges of anxiety and/or depression. It’s not saying it’s a substitute for medication or actual therapy. More like it’s a great addition to those options or for those who are able it can work as a substitute. It’s different for each person. It may change based on stages in your life. 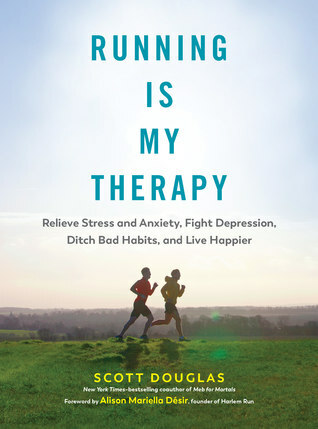 I needed this book at this exact time in my life and as corny as I’ve used the phrase/hashtag “running is my therapy” without ever knowing it was a book and a phrase that carried people just like me through the challenges of anxiety and/or depression. I guess this wasn't really my type of running book. The author came off as kind of snobbish. For someone writing a book about running he seemed like he didn't like people who asked him questions about running. If you are a 5K runner, don't bother wish this book. The author seems to barely mention 5K distances. Although in the beginning he does say, "if you run, you are a runner." But that's where it stops. Consistent mentioning of 10K and up and up (to ultramarathon distances) and training for ra I guess this wasn't really my type of running book. I received a copy of Running is My Therapy from Netgalley in exchange for my review. All opinions are my own. A more comprehensive review can be found on my blog, https://www.takinglongwayhome.com. I often say that running is my therapy and I'm not alone. Nothing new here, but just validation of why running feels so good to so many of us who suffer from anxiety and depression. The book felt like a long Runner's World article, but that's ok.
Running is my therapy. Well, exercise is my therapy - yoga, walking, daily workouts of some kind - but running makes me feel like a better version of myself. It clears my head, lets me go on autopilot and find a “flow” state far better than yoga. While I don’t suffer from any diagnosed mental illness, the tips and ways that running is more than fitness completely resonate with me. Nice to know that it’s not all in my head. Douglas' book sheds light on the impacts of running on mental health. As an avid runner and someone who struggles with mental health personally, it was insightful to learn about the science behind why I feel better after my runs or disappointed when I miss a run. It was a bit technical at times but is a resource I can refer to when I want to learn about the psychology attributed to running. 3.5 stars. Another reviewer referred to this as akin to a very long Runners World article. I’ll second that, but not in a negative way. Very information and research dense, basically explaining why running works on both physical and psychological levels. Nice reinforcement for what I’ve already known experientially, and motivates me to experiment more with my running. Author's anecdotal benefits of running, combined with a summary of the scientific research on the impact of running on depression and anxiety. An interesting, balanced read/listen. Listened to most of it while running. Good read. Anecdotal and factual. Liked the stories and honesty. Easy reading. Insightful for those suffering and using exercise as therapy. Best of the best! One of a kind and absolutely well-written and well-researched. The best book on running and brain I came across so far and a must read for anyone who is interested in the subject of brain, mental well-being and physical exercise. Livro interessante. O autor vai mostrando, por meio de estudos científicos e de sua própria vivência, os benefícios da corrida. É uma ótima leitura principalmente para aqueles que ainda não se iniciaram no esporte e precisam de um empurrão para ganharem consciência que correr faz bem à saúde. Ehhh- worth a listen during a run! Scott Douglas is a contributing editor for Runner’s World. He has also been the editor of Running Times and Runner’s World’s news channel. Douglas has written or cowritten several other books, including the New York Times bestseller Meb for Mortals and perennial favorite Advanced Marathoning. He lives in South Portland, Maine.